Are you trying to procure and implement a new intranet in 2014? Get started on the right path with 10 Steps to a New Intranet. This webinar is now complete. You can view the video recording below. We take the ready, aim, fire approach to software projects — believing that you should thoroughly understand your intranet objectives and your business requirements before evaluating intranet solutions. This webinar will guide you through 10 best practices when buying intranet software. We’ve worked with hundreds of intranet buyers over the years, and we’ll share tips and tricks we’ve learned along the way, as well as advice on avoiding common pitfalls. How do I align intranet objectives with business goals? Who do I need to involve in my intranet project? How do I write intranet requirements that will deliver on my objectives? How do I manage IT, budget, language, and resource constraints? What are the different kinds of intranet solutions available? How do I evaluate different intranet vendors and ensure their product matches my needs? This webinar will be 40 minutes, followed by a 20 minute Q&A period to allow for discussion and specific questions. 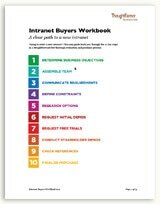 This webinar works in tandem with our Intranet Buyers Workbook, available for free download. We recommend downloading and reviewing the buyers workbook before the session. Intended audiences: Those looking to start a new intranet project within the next 12-24 months, including Project Managers, HR, Communications, Procurement, and IT.